Sure, he was talking about the murder of White’s partner (and stand-in son) Jesse Pinkman, but I am glad to see the Leafs are finally embracing Mike’s philosophy. At least, as much as was possible. Talk of tanking ramped up through the bitterly cold month of February, and finally, as February turned to March, Dave Nonis and the Leafs executed a few trades that could be seen as “Rebuilding” moves. First, let’s retrace their steps. On February 19th, forward Mike Santorelli and defender Cody Franson were sent to Nashville in exchange for centre Olli Jokinen, winger Brendan Liepsic, and Nashville’s first-round draft pick in 2015. The Predators are currently battling the Anaheim Ducks for the first place spot in the Western Conference, and first in the league, so odds are that pick falls somewhere between 27-30 in the first round. It likely won’t become a world-changing player, but it is a valuable asset. On February 25th, Nonis executed another player-for-pick swap in sending forward Daniel Winnik to the Pittsburgh Penguins for a 2015 fourth-round pick, a 2016 second-round pick and pending free-agent centre Zach Sill. A day later, the Leafs announced the incredible David Clarkson-for-Nathan Horton trade. Nonis was able to shed an albatross of a contract, only to get a potential albatross in return. Clarkson had under-performed in his time as a Leaf, and his average salary of 5.25 million per year put a choke hold on the Leafs in free agency. The Blue Jackets saw Clarkson as a potential helpful veteran for a young team looking to make strides next season (or, they wanted a player who can, you know, actually play). Nathan Horton, currently sitting on the Injury Reserve (IR), will probably not play hockey again. Nonis was able to justify the move by saying, “We get a player that if he could ever come back is an elite player. In the event he can’t, we created some cap space.” If Horton stays on the IR, his salary does not count against the cap. David Clarkson: traded for a guy who can’t play anymore. The idea of Horton as an “elite” player is questionable. His most productive seasons saw him tally 62 points in 2006-07 and 2007-08, as the lone star on a terrible Florida Panthers team. He joined the Boston Bruins in 2010, registered 53 points, and has not played a full season since that 2010-11 season. Still, while most would agree he’s better than Clarkson, his true value to Toronto is in his move to the IR. It’s a lucky break that the Leafs can afford to pay a player not to play, while the poor Blue Jackets can’t. On Monday, details emerged of two more moves; The Leafs sent Jokinen, who had just joined the team on February 19th, to St. Louis for centre Joakim Lindstrom and a 2015 sixth-round pick. Standard move there. Also on Monday, defender Korbinian Holzer was sent to Anaheim for the expiring contract of defender Eric Brewer and a 2016 fifth-round pick. Rumours also swirled on Monday of defenceman and captain Dion Phaneuf being traded to Detroit, but that never materialized. Remaining trade assets on the Leafs roster are Phaneuf, forwards Tyler Bozak, James van Riemsdyk, and Phil Kessel, and goalies James Reimer and Jonathan Bernier. The Leafs will now have to wait until the end of the playoffs before making further moves to strip down and restart. SO WHAT ARE WE LOOKING AT NOW? Well, for one thing, we’re looking at a team that hardly cares about being on the ice anymore, and maybe don’t even really like each other that much. But that’s OK. The more losses tallied up, the closer we get to the chance of the first overall draft pick, also known as Connor McDavid. But even if that doesn’t happen, the Leafs stand a fair chance of falling inside the top 3, and definitely inside the top 5. In a strong draft class, that is a huge positive. Nonis and the Leafs have assembled eight draft picks in this summer’s draft, and nine for the 2016 draft. If they are able to move one or more pieces in the summer, they could enter the double digits and have tons of cap space for the July free agency period. Obviously, McDavid would be a grand slam, but it’s unlikely, so it may be worth talking about centres Jack Eichel, Dylan Strome and Mitchell Marner. Eichel is a strong, two-way centre, who plays for Boston University, and also won the 2014 IIHF World U18 gold medal with the US National Team. He is likely to go second, after McDavid, so chances are still slim that he lands with the Leafs. 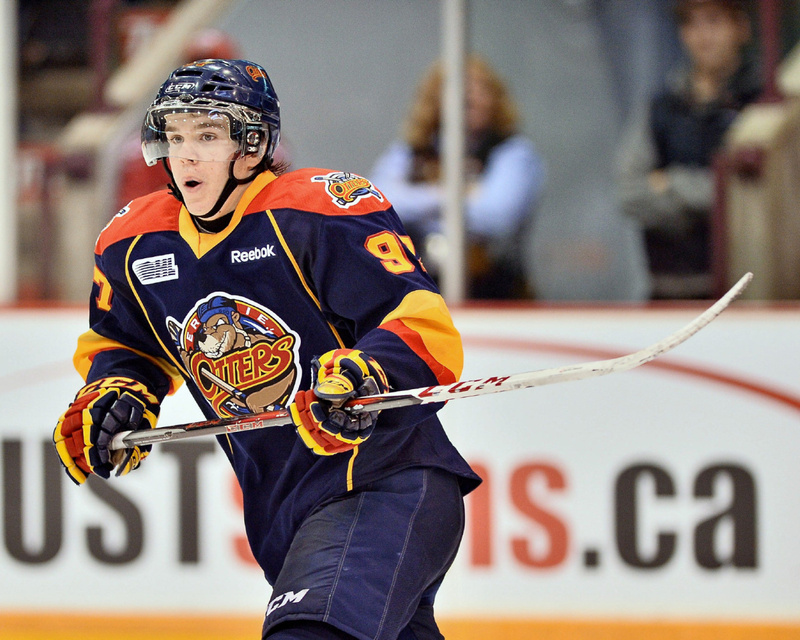 Strome is a local kid from Mississauga, who currently plays for the Erie Otters of the OHL. He is a playmaking centre, who has amassed 73 assists, along with 36 goals, in 59 games so far this season. He falls second in the league in points, behind only Mitchell Marner. Marner has shown more goal-scoring touch and has tallied 119 points in 56 games, with 43 goals and 76 assists. Marner is a Markham product who plays for the London Knights. While McDavid and Eichel would be ideal, Strome and Marner seem the more likely, and if you believe Don Cherry, would be a step in the right direction as the Leafs acquire a local kid who would play “harder” for their hometown team. Using Nashville’s pick toward the end of the round, the Leafs will likely be looking at one of several defenders, including the QMJHL’s Nicholas Meloche or Jeremy Roy, or Sweden’s Gabriel Carlsson. Looking forward to 2016, if the Leafs stay in the lottery, wingers will dominate the discussion. Americans Auston Matthews and Max Jones appear to be the top prospects right now, while Europeans Jesse Puljujarvi and Dmitry Sokolov have impressed as well. Connor McDavid: the new kid everybody’s talking about. PICKS ARE NICE, BUT WHAT ABOUT WARM BODIES? Every discussion of the Leafs players currently under contract, including the one by my illustrious colleague Dan Grant, begins with 20-year-old defenceman Morgan Rielly. The Vancouver native has blossomed into a potential all-star, and will form the backbone of the team hopefully for many years. Americans Jake Gardiner and Tim Erixon (recently acquired from Chicago), both just 24, stand a chance to become solid defenders. Captain Dion Phaneuf may be difficult to move, and any discussion of the Leafs moving forward automatically includes him until proven otherwise. At forward, there are a number of tough players to move. Phil Kessel leads that list, with an annual cap hit of 8 million dollars until 2022. Unless the Leafs agree to eat some of that salary, he will continue to be a part of the roster for years to come. Joffrey Lupul averages 5 million a year, while Tyler Bozak and James van Riemsdyk average around 4 million a year. Some of these are movable pieces, while van Riemsdyk seems to be the player to hang on to. He comes in at the best price, and, at just 25, the youngest age. 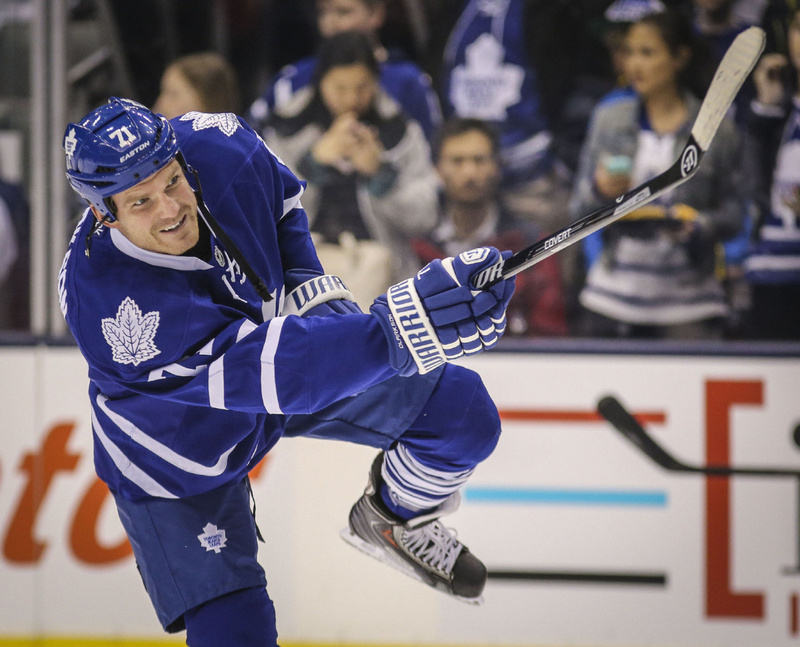 Centres Peter Holland and Nazem Kadri, both 24, should be viewed as priorities to develop further, as well. The goalie situation was mismanaged early on; Bernier and Reimer should have been used to make each other better, to challenge each other in practice. Instead, Bernier was given the lion’s share of games, while Reimer has seen his playing time, and market value, plummet. If they are able to move Reimer, they should, and bring youngster Christopher Gibson some NHL playing time next season. Bernier still looks to be the goalie of the future. Goaltenders Gibson and Antoine Bibeau have done well while sharing time. Gibson is the elder of the two, and should be promoted next season, while allowing Bibeau to play major minutes in the AHL. On defence, the trio of Stuart Percy, Petter Granberg and Viktor Loov could ably replace Stephane Robidas, Eric Brewer, and Roman Polak. Not that all three of the senior players would be gone at once, but capable replacements are available, should trades come up, or to create even more cap flexibility. Young wingers Connor Brown and Brendan Liepsic have both played well in the AHL, and could be used to push current Leafs, or to push them out. CAP SPACE, CAP SPACE… WHO IS AVAILABLE TO SPEND MONEY ON? 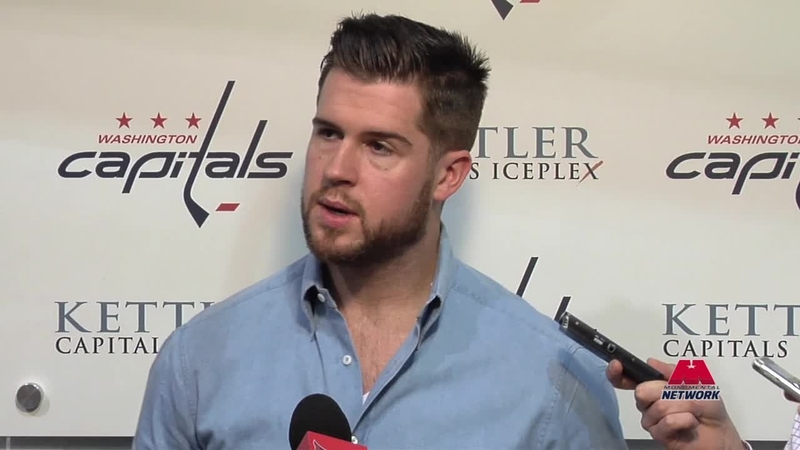 Washington Capitals defenceman Mike Green may end up being the top priority for teams in July. He is yet to re-sign with the Caps, and he is currently 29 years old. He is a point-scoring defenceman, who in his best season, notched 76 points and a plus 39 for the Capitals in 2009-10. More recently, those numbers have dipped, but Green would still qualify as a premier defender. Also available, if the Leafs decide to make a move in net, will be San Jose Sharks goalie Antti Niemi. The Finn has consistently been one of the league’s best, and few teams will be in as strong a position to land him as Toronto. Alternatively, the Leafs could sit on the cap space, tread water for another year, and go big in the summer of 2016. That year, Steven Stamkos will go unrestricted, and here’s hoping that the Markham native is looking to join his hometown team. Also potentially available will be Anze Kopitar, the Los Angeles Kings’ elite centre. Maybe waiting one year will be in the best interests of the team. SO HOW DID THE LEAFS DO? Other than stalling on a potential Phaneuf deal, I think Toronto made the best moves available. I don’t think many teams were jumping to acquire Kessel, especially at his price, and he may end up sticking around for the length, or negotiating a buyout at some point before 2022. If more moves become available in the period leading up to the draft, Nonis would be wise to jump at them and strip the roster down further. Acquiring young, cheap players and draft picks is often not exciting, and in some cases, downright atrocious. But stocking up on these assets can often work out for the best, whether that ends in drafting a Connor McDavid, signing a Steven Stamkos, or engineering a monster trade for another superstar. Nobody likes to hear the word “tanking” about their team, but “mediocre and overpaid” sounds much worse to my ears. It should only be full measures from here on out.